Here are some snazzy birthday facts about 4th of July 1963 that no one tells you about. Don’t wait a minute longer and jump in using the content links below. Average read time of 10 minutes. Enjoy! What day was my birthday Jul 4, 1963? July 4, 1963 was a Thursday and it was the 185th day of the year 1963. It was the 27th Thursday of that year. The next time you can reuse your old 1963 calendar will be in 2019. Both calendars will be exactly the same! This is assuming you are not interested in the dates for Easter and other irregular holidays that are based on a lunisolar calendar. 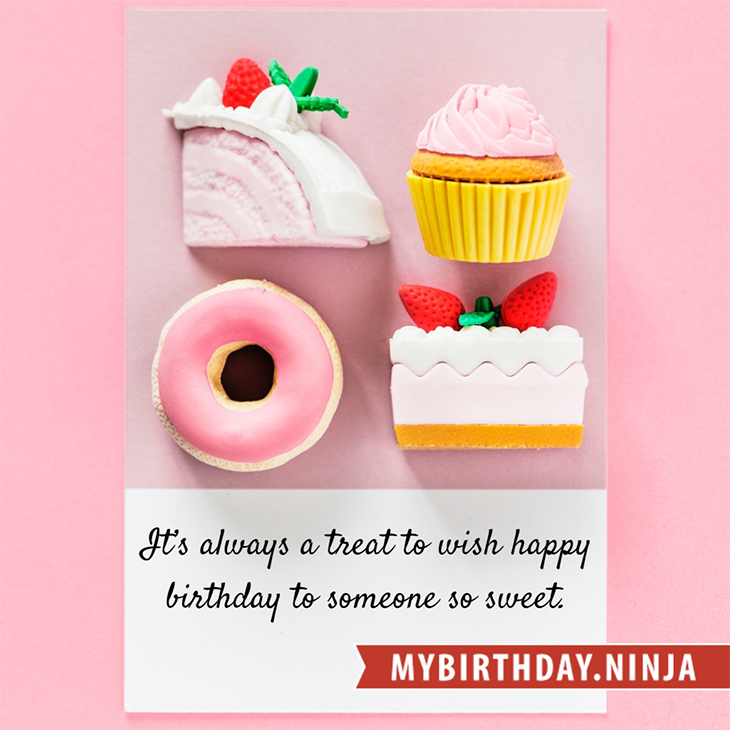 There are 76 days left before your next birthday. You will be 56 years old when that day comes. There have been 20,378 days from the day you were born up to today. If you’ve been sleeping 8 hours daily since birth, then you have slept a total of 6,793 days or 18.60 years. You spent 33% of your life sleeping. Since night and day always follow each other, there were precisely 690 full moons after you were born up to this day. How many of them did you see? The next full moon that you can see will be on April 19 at 11:14:00 GMT – Friday. Fun stat: Your first one billion seconds (1,000,000,000) happened sometime on March 12, 1995. If a dog named Ruby Delicou - a English Toy Spaniel breed, was born on the same date as you then it will be 240 dog years old today. A dog’s first human year is equal to 15 dog years. Dogs age differently depending on breed and size. When you reach the age of 6 Ruby Delicou will be 40 dog years old. From that point forward a small-sized dog like Ruby Delicou will age 4 dog years for every human year. Lewis Carroll tells Alice Liddell a story that would grow into Alice’s Adventures in Wonderland and its sequels. A massive heat wave strikes the northeastern United States, killing 380 people in eleven days and breaking temperature records in several cities. Israeli commandos raid Entebbe airport in Uganda, rescuing all but four of the passengers and crew of an Air France jetliner seized by Palestinian terrorists. The discovery of particles consistent with the Higgs boson at the Large Hadron Collider is announced at CERN. What does my birthday July 4, 1963 mean? Your birthday numbers 7, 4, and 1963 reveal that your Life Path number is 3. It represents vision, imagination and joy of living. You possess a great talent for creativity and self expression. The following celebrities also have the same life path number: Tinashe, Jesse Blaze Snider, Mahalia Jackson, Michael Swan, Liane Balaban, Julia Migenes, Bridget Fonda, Kym Whitley, Yuki Matsuoka, Killer Khan. What is the birthday horoscope for Jul 4, 1963? The Western zodiac or sun sign of a person born on July 4 is Cancer ♋ (The Crab) – a cardinal sign with Water as Western element. The ruling planet is Moon – the celestial body of moods and emotions. According to the ancient art of Chinese astrology (or Eastern zodiac), Rabbit is the mythical animal and Water is the Eastern element of a person born on July 4, 1963. Fun fact: The birth flower for 4th July 1963 is Larkspur for haughtiness. What is the Love Match for Jul 4, 1963? When it comes to love and relationship, you are most compatible with a person born on July 3, 1936. You have a Love Match compatibility score of +108. Imagine being in love with your soul mate. On the negative side, you are most incompatible with a person born on January 8, 1971. Your incompatibility score is -115. You’ll be like a cat and a dog on a love-hate relationship. Arf-arf, I want to bite you. Meow-meow, stay away from me! The number-one hit song in the U.S. at the day of your birth was Easier Said Than Done by The Essex as compiled by Billboard Hot 100 (July 6, 1963). Ask your parents if they know this popular song. How many babies were born on July 4, 1963? Base on the data published by the United Nations Population Division, an estimated 113,464,323 babies were born throughout the world in the year 1963. The estimated number of babies born on 4th July 1963 is 310,861. That’s equivalent to 216 babies every minute. Try to imagine if all of them are crying at the same time. What is the popular baby name on 4 Jul 1963? 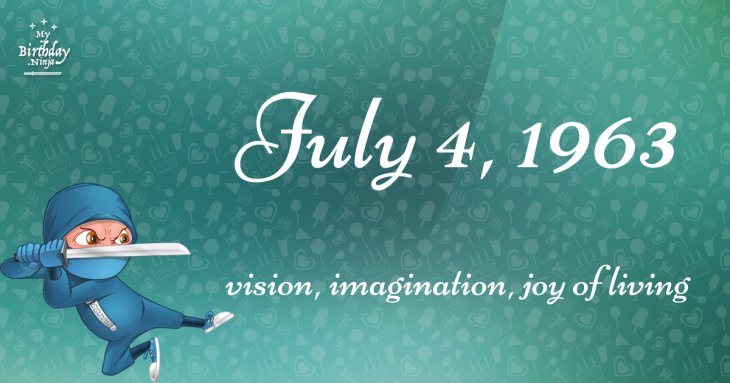 Here’s a quick list of all the fun birthday facts about July 4, 1963. Celebrities, famous birthdays, historical events, and past life were excluded. Try another birth date of someone you know or try the birthday of these celebrities: June 26, 1974 – Matt Striker, American wrestler, sportscaster, and actor; September 13, 1931 – Barbara Bain, American actress; April 5, 1954 – Peter Case, American singer-songwriter and guitarist (The Nerves and The Plimsouls).